When you have fully recovered, your doctor will inform you, at least one day in advance, of your discharge from FV Hospital. In accordance with our policy, we ask you to depart before 11am x 2 on the day itself. To simplify matters, either you or an authorised relative or friend can complete the discharge process with our International Patients Officer and staff. A detailed report of all charges will be supplied. The International Patients Officer will be pleased to assist you if you should require any further explanation. Our International Patients Officer will also assist you to complete final payment and discharge formalities. We want to ensure that you receive the best care following your discharge - the FV Hospital Pharmacy only offers medication that conforms to international standards, uses approved suppliers and stores medicines in the correct conditions in compliance with manufacturers’ specifications. Our International Patients Officer will assist you to collect your post-discharge medication and our pharmacist will explain the prescription: what the medication is for, how and when to take it and how to renew, or to ask your home doctor to renew, the prescription should such action be required. A prescription for medication, where necessary. 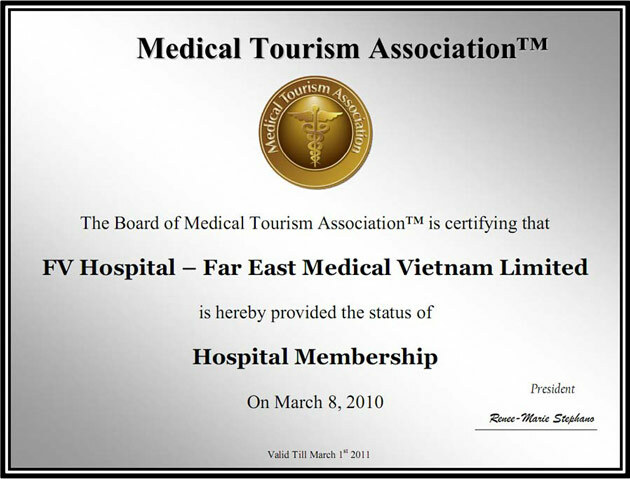 A medical report in Vietnamese, French or English (other languages are available if requested in advance). Copies of scans, X-rays, test results and other possible examinations that have been done at FV Hospital. An appointment card for your follow-up consultation with your doctor (the first follow-up consultation is included in the package price). Our International Patients Officer will inform you about the schedule for your follow-up consultation and make sure everything is in order before you leave the hospital.